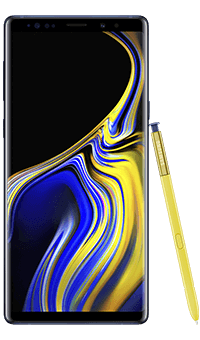 With the largest Infinity Display ever, breath-taking performance speeds and the redesigned S Pen, the Samsung Galaxy Note9 is powerful enough to keep up with you. Immerse yourself in unparalleled viewing and listening experience. Samsung's largest Infinity Display yet and dual stereo speakers tuned by AKG with Dolby Atmos will let you lose yourself in a cosy movie marathon, or the hottest album of the year. Say goodbye to photos with poor lighting, closed eyes or blurriness – the Galaxy Note9 has Dual-Aperture and flaw detection, so your shots will always come out crisp and on point. And with Live Focus, you can easily put your subject in the limelight, and blur the background with Bokeh. No more staring at loading screens – the Galaxy Note9 has a cutting-edge processor that lets you browse the internet and use your apps as quick as lightning. And thanks to Samsung's most powerful battery ever, your phone will charge fast and last long. Scribble down notes, change presentation slides or take full body selfies up to 10 metres away from your phone, with the redesigned S Pen. Unlock your phone with your fingerprint, eyes or face – when you're the key, you can rest assured your files and photos are safe.